My forthcoming book, Twelve Pickups, is a memoir about my life-time association with pickup trucks, the most charismatic vehicles ever mass produced. I’ve never owned a new pickup. Over the past forty-nine years, I’ve had twelve of them and all were used, my favorites more so than others. As it happens, these were mostly trucks from the nineteen sixties and seventies. Because they’re easy to work on, because these trucks ran contiguous to the prime of my life, and because I happen to think they are still what a pickup should look like, and not the bulging, gadget- ridden trucks produced today. From this it must be clear I’m not totally objective, that the older vintages still speak to me in a way the new trucks don’t, but I’m willing to allow this is not the case for everyone. There’s Flash, the foppish F100 Ford XLT. In ’76, I drove it from Carolina to the Rocky Mountain West, where it promptly puked and disgraced itself. 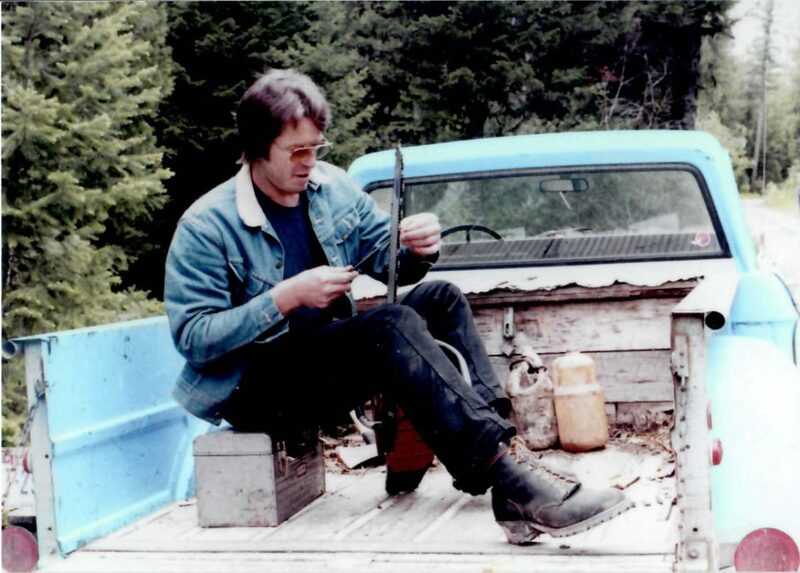 There’s Blue Dog, the lion-hearted D100 Dodge I bought in ’77 when I sawed beetle kill at 9,000 feet. I drove it to Missoula in ’78, where I studied creative writing and met the love of my life in poetry class. There’s Trigger, the spavined D200 Power Wagon which carried Caroline and I on our Olympic Coast honeymoon. There’s Dream Truck, the magnificent Chevy C-30 flatbed I started a tree business around, only to sell it two years later when we moved to California. There are many others – Mitzi and Green Bean, Lumpy and Harlo – each of them a companion on the grand road trip of my life. When is a pickup more than a truck? When it functions beyond being an essential tool and becomes a rolling testament of your life. On these rare occasions, pickups are known to transcend mechanical essence, rise to become comrade, ally and intimate. Of the estimated sixty million pickups on American roads today, just one in eight was bought specifically for work purposes. The remaining fifty-four million are what truck dealers call “life-style purchases.” That means you don’t need a truck, you just want one. That means you buy one because you like the way they look. Or the way they make you look. In this way, your average cyber geek gets to roll like a buckaroo. An I-Banker rides the high-range freeway. And a bashful Morris dancer gets to channel her inner steer-wrestler. This pickup-as-accessory business seems, at first, a painful example of the all-hat-no-cattle syndrome and it’s tempting to write it off as pure affect. The impulse springs from some deep, organic longing. But longing for what? Simpler times? Our agrarian roots? A larger than life driving experience? Whatever the case, every year, pickups far outsell all other kinds of vehicle. In this way, they represent a billion-dollar fulfillment industry, helping tens of millions of Americans reclaim their misplaced authenticity.